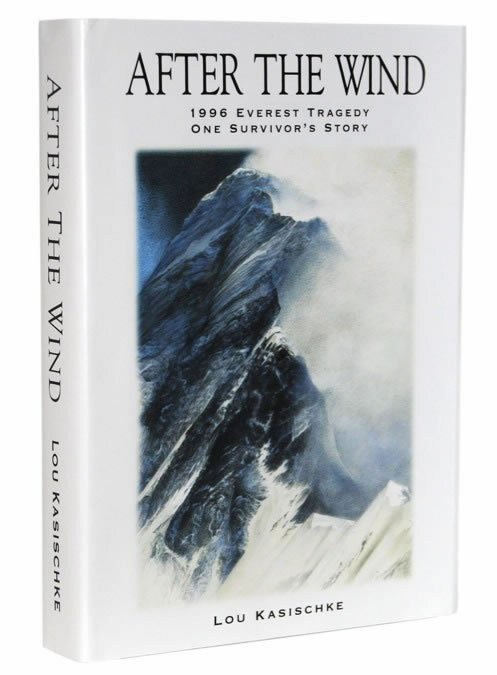 After the Wind is a compelling account of one man's journey almost to the top of Mount Everest. It's captivating because it's Lou Kasischke's honest tale of his decision to abandon his quest just as he was close to accomplishing his goal. It's more than an adventure story because it's also Kasischke's heart-wrenching story of why he turned around. I cannot be objective about this book because I worked with the author for several months last year and I have a deep emotional connection to this book. Lou told me he wanted to publish the book he’d written seventeen years previously and had rewritten over the years. He hired me to read it and write a review of it as I would if it were to be included on this review site. In one section of that mock review I stated “His story is too wordy and he often lapses into explaining what he's just successfully shown the reader but the story is such a strong one that this reader forgave him for wanting to elaborate on it.” After reading my words, Lou hired me to note specific observations and to make recommendations as well as to copy edit the book. Last summer and fall Lou worked harder than anyone I’ve ever coached to tighten his work and to concentrate on his objectives for writing and publishing his story. I reread After the Wind six times as Lou continually endeavored to improve it. I believe that Lou’s book now concisely tells the story of his remarkable journey as seen through his eyes and it carefully sticks to his main objective of honoring his love for his wife, Sandy. That said, I’m glad to report that “Kirkus Reviews,” one of the toughest review publications in the business, gave After the Wind a glowing, starred review. In addition to being an account of one of the world’s worst climbing tragedies, this book is enhanced by magnificent illustrations. 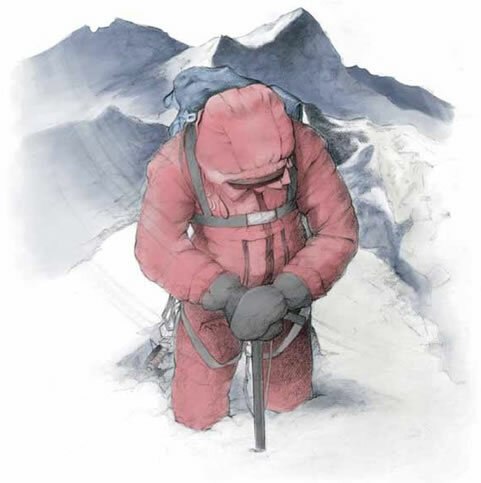 Artist Jane Cardinal’s drawings set the book apart from other depictions of the disaster because they portray the emotions, the weather, and the absolute immediacy of the trek. I consider Jane a good friend; we worked together on another book that she illustrated and I edited so it’s not easy for me to be objective about her or her work but I firmly believe that the stark simplicity of her drawings make this book something singularly beautiful. Jane is recognized internationally as an artist, illustrator, and iconographer and her talent is firmly on display in After the Wind. This is a book that should get a lot of attention because Kasischke was a part of the team so famously portrayed in Jon Krakauer's celebrated account, Into Thin Air. Readers of Krakauer's story will quickly note that Kasischke views some things differently than Krakauer did. After the Wind asks serious questions about why the tragedy occurred. As a survivor, Kasischke's pondering makes the reader wonder if embedding a journalist was part of the problem that led to the death of five members of their team near Everest's summit. Kasischke takes the reader along with him on the trek and the sacrifices, cold, misery, and dangers made this reader wonder why any happily married, sane, successful man would undertake such a perilous trip. Thankfully, Kasischke tells the reader why while showing the doubts he entertained. Kasischke interweaves the adventure aspect of his trek with the ever present “still small voice” of his wife – the voice that perched on his shoulder, inhabited his heart, and forced him to question. Kasischke tells a story that readers of adventure books like Unbroken and Into Thin Air will want to devour. “Everest,” the new movie about the tragedy, is set to debut in September, 2015, and it should add to the debate about why the tragedy transpired. Read this book before seeing the movie that should be a blockbuster with stars like Jake Gyllenhaal, Jason Clarke, Kira Knightley, John Hawkes, Michael Kelly, and Emily Watson. Mark Derwin plays Kasischke and Josh Brolin portrays the incomparable Beck Weathers who is someone I feel I know after Kasischke’s portrayal of him. Summing it Up: Read After the Wind for a powerful account of the 1996 Everest tragedy as seen through the eyes of a survivor who asks hard questions about what went wrong while taking the reader along on his cold, harrowing journey. After the Wind honors those who died on the mountain on that infamous day by sharing new insights into their quest. Read this account so you’ll understand why Lou Kasischke needed to be certain that he lived a story he could tell. Footnote: I strongly suggest that you purchase this book from an independent bookstore in northern Michigan where Lou Kasischke lives. It won’t cost any more than buying it on Amazon (it may be less) and you’ll be able to obtain an autographed copy. Between the Covers and McLean & Eakin Booksellers will quickly mail you a copy as they have them in stock. With that thought, 11-year-old Eva’s mother abandons her on the doorstep of her absent father’s home where she’s tossed in with her beautiful actress half-sister, 16-year-old Iris, and their negligent father. The girls run away to California where Iris acts in movies until “ruined” by an affair with a famous actress who abandons her when revealing their love threatens her career. Meanwhile Eva transforms herself like a displaced person to become all that everyone in her upside-down life needs. Taking place from 1939 to 1948, Lucky Us shows how family is much more than genetics especially in war time when resilience is the only thing that really matters. Lucky Us also serves up an unexpected bonus in that each chapter is named with a jazz title from the era. These set the period mood and put the reader in the movie sets, automobiles, and wartime beauty parlors where the novel’s action takes place. Bloom’s website provides links to listen to the chapter openers and going back to reread parts of the novel after listening to the music is like getting extra hot fudge on an already delicious sundae. Whether you choose to listen to the music as you read or after, the songs will delight you as would a thirteenth doughnut put in your hand by a kindly baker. Summing it Up: You’ll feel like you’re sitting at a 1940s soda fountain counter sipping a creamy milkshake surrounded by characters whose adventures you want to join when you read this captivating novel. But when you climb down from the stool and head home, the characters, the sweetness of redemption, and the brilliant sentences will enter your soul. Connecting people with books they'll love is what I do. I lead three book clubs and participate in another. I speak about books to library, university, social and civic groups and I'd love to speak to your gathering. My annual book list of the more than 100 books I read and review every year comes out every November. Find past lists on the pages listed below. Because I'm always hungry for good books, I categorize the books on the lists and on my posts by food groups as explained in the review categories listed below. Contact me with questions or about hiring me to speak at trinabookhungry@gmail.com or by posting a comment on one of my reviews. I use the language of food to categorize books that I read and review: CC: Chinese Carryout (page-turners, great for plane rides), DC: Diet Coke and Gummi Bears (young adult books), G: Gourmet (exquisite writing requiring concentration), GPR: Grandma’s Pot Roast (books that get your attention and stick with you), GS; Grits, Southern Fried Chicken, and Pineapple Upside Down Cake (distinctly evocative of the American South), OC: Over Cooked (good ingredients, but overwritten), PP: Pigeon Pie (historical fiction, parts or all of the novel set at least 50 years ago), PBJ: Peanut Butter and Jelly (children’s books adults will like), R: Road Food (audio books for road trips), SBP: Sweet Bean Paste (international literature), SF: Soul Food (spirituality, theology, books for your soul), SN: Super Nutrition (lots of information, yet tasty as fresh blueberries), S: Sushi with Green Tea Sorbet (satire, irony, black humor, acquired taste), T: Tapas (small bites including short stories, essays, and poetry), D: Dessert (sheer delight). The letters BC denote books recommended for book clubs. The snail signifies my belief that everyone should slow down and devour a good book.